How is the dashboard camera powerd? Does a memory card come with the purchased unit? The P3 includes a 16GB memory card which is where the digital map is stored. The memory card is not included with the purchase of any of our other dashcam units; it has to be purchased separately. Both P2 Pro and P3 has set default 1080p resolution and the GoSafe 110, GoSafe 330 and P1 Pro both allow for different resolution settings. Please refer to our spec sheet. The GPS on the P3 and P2 Pro is only for GPS logging purposes only, and it is not a GPS Navigation system. What is the difference between a GPS logger and a GPS navigator? The GPS Logging function on the P3 and P2 Pro allows the camera to record speed and location data (longitude, latitude, state and road) on the recorded videos, it also allows the camera to display the current speed of the vehicle while the vehicle is being operated. It will not display maps or guide you to the selected destination. Does the dashboard camera have a built-in batteR? None of the PAPAGO! dashcams come equipped with a built-in battery. They are designed to be powered on through the cigarette charger. The model of GoSafe 330 and GoSafe 110 provide motion detection features. With power source supplied, it will start recording once motion is detected in or around the vehicle. The power supply from cigarette charger was designed differently by each car manufacturer. 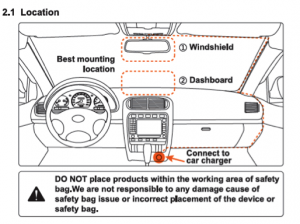 We recommend to test or check the user manual of your car for more details. Is it safe to hardwire the dashboard camera in my vehicle? It is safe to hardwire the device to your car battery but we recommend buying the proper cable from your local retailer. You do so at your own risk. No, the dashboard camera will automatically turn on and start recording when the cigarette adapter plug receives power. How do I save a file when I am driving? How do I make the dashcam suction cup mounts stick? How do I update Maps on my P3? We have found that there are some compatibility issues with some brand name SD and MicroSD cards even after you format the card correctly. There are so many SD and Micro SD cards available for purchase that we cannot build a proper list at this time. One brand we noticed that has more issues than most is Sandisk. We hope to build a better list in the near future.